In High Park, one of the things that many people look forward to in the spring is the iconic soft pink coloured flowers of the Cherry Blossoms trees. Although these blooms are quite an exciting sight, there are also many other beautiful blooms that we are looking forward to this season. In fact, one of these blooms, often overlooked, is starting to happen in the park right now! Your first instinct might be to start looking down on the ground but, if you look up instead, you'll notice hundreds and thousands of reddish buds swelling along the branches of the Silver Maple trees. These buds are patiently waiting for a day, where the weather is perfect, to burst into bloom! Silver Maples are one of the first trees we see flowering in the spring. Their flowers don’t look the way you expect a flower to look; their petals are not very noticeable and they looked more like tiny red pom-poms. This is because maples are wind-pollinated and don’t need the showy petals to attract insects. The flowers are also generally either male or female. Female flowers will have reddish clusters of pistils1, while the male flowers will have a bundle of yellowish-green stamens2, tipped with pollen. Look for that beautiful haze of red in the branches on your next visit to High Park! P.S. 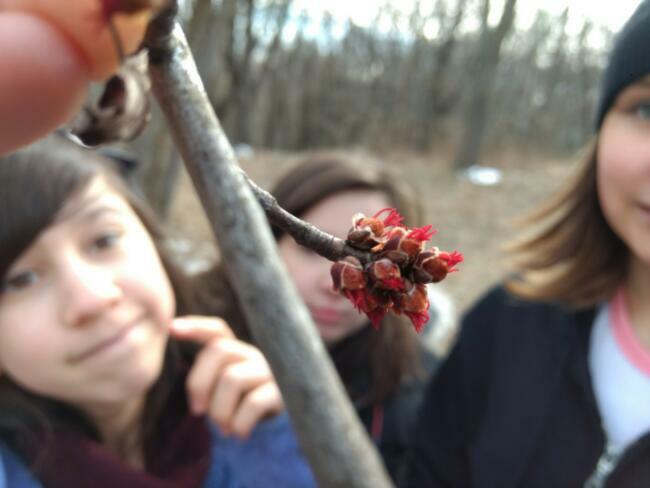 Since silver maple flowers bloom within a few days of each other, make sure to look quickly because the blooms won’t last very long!